Pioneers in the industry, we offer hull and seed separator from India. In this process, the Hull and Seed Separator are separated from the seeds unbroken seeds are again subjected to Huller Shaker. It is used for minimum oil absorption and best separation of hulls from large meats and uncut seeds. 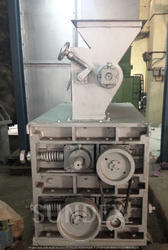 This process is mainly used in case of Cotton Seed/Sunflower. Looking for Hull and Seed Separator ?